It began on July 7, when the first test game was held. SSV Jahn played the selection of South Bavaria. 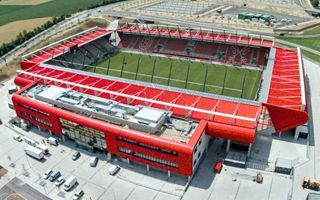 The stadium passed its evaluation and just three days later held a more official pre-season game between Jahn and FC Augsburg. This weekend it was all about community as citizens were invited to participate in numerous activities, most importantly in open tours of Continental Arena. In terms of football it was hardly the desired opening. First test game was lost by the home side 1:2 and in the other Augsburg managed to defeat Jahn higher, 3:1. As if this wasn’t enough, from now on the team will be trying to fill as many seats as possible in the fourth league. So why build a 15,000-capacity stadium in such a low tier? Well, it wasn’t always like that. The old Jahnstadion opened back in 1926 had been considered insufficient for years as SSV Jahn battled to move up from the 3. Liga. As they managed to win promotion in 2012, the project of building a new stadium gained impetus. The city selected an interesting concept by experienced agn Niederberghaus & Partner and in autumn of 2013 signed the construction contract with BAM Sports. The contractor entered his worksite in January 2014 and since then had 18 months to deliver the new arena in outskirts of Regensburg. The location along southern bypass lies in previously rural area of Oberisling. Road access is superb and over 2,000 parking places (10% for VIP guests) and 800 bicycle stands were created beside the building. While work was done within the time frame set by Regensburg municipal authorities, budget issues raised some criticism. The stadium was previously hoped to be built within €30 million, while already in late 2013 the price went up to €52.7 million ($58m). Further scepticism arose as SSV Jahn were relegated first from the 2. Bundesliga and then even from the 3. Liga just before stadium opening, prompting fears of the venue generating losses. Some of that criticism was eased as the city signed naming rights deal with Continental for 5 years, also leasing some of the floor space to the tire giant. In the end stadium opening was still an exciting moment for locals as thousands flocked it to take a visit or watch pre-season games. The stadium was built not only ready for advancing to the Bundesliga, but even for expansion. Empty corners pay an important role in aesthetics, but if needed can be filled with additional sections, raising capacity to some 18,000. This was enabled by using 28 small masts on top of the roof (peak at 25m) instead of four large corner masts. Such solution also limits light pollution at night. In already mentioned aesthetic terms the stadium boldly represents club and city colours, which is almost a trademark for agn designs. Bright red tinware is folded in a peculiar way and stands in contrast with cold concrete supports going through it. The seating layout is almost traditional. Almost, because the main grandstand was located in the east rather than classic west alignment. It hosts two business clubs (300 and 1,000 square meters) and 4 skyboxes (25-60 sqm). All rooms are flexible and may be adjusted by moving walls. Most vocal Jahn supporters are located in the south, having some 5,264 standing places. Away enclosure is in the north, split nearly 50/50 between standing and seating, offering roughly 900 places of each kind.